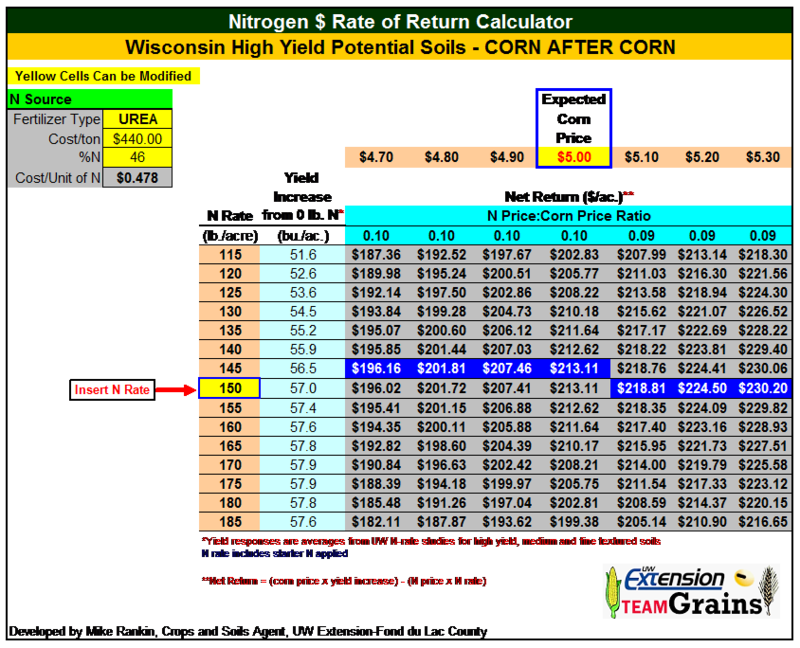 Mike Rankin, Crops and Soils Agent,UW Extension-Fond du Lac Co.
A simple spreadsheet can be used to evaluate different net return per acre scenarios involving nitrogen (N) source, N cost, and expected corn price. The spreadsheet lets you evaluate multiple different combinations of fertilizer type, cost, expected corn price, and yield responses at any one time. The user has the option of changing fertilizer type, cost, corn price, and N rate. The combination giving the highest return to N is highlighted within the price sensitivity table. Users must select proper Wisconsin yield potential/soil type from the first worksheet or tabs at the bottom of the spreadsheet. The new version 4.1 approximates the April, 2010 updated UW nitrogen recommendation program for corn. It also contains information and links to more detailed information about the recently developed regional approach to N recommendations. Previous post: Beta test – Seedcorn maggot thermal model, first-generation peak adult emergence at 360 D.D.